CHI Scientific has extensive experience in providing custom DNA services for the life sciences industry. As one of the largest life science reagent suppliers in the world, CHI Scientific is able to offer its clients competitive pricing while maintaining one of the highest quality standards in life science research community. For additional information regarding this service, please contact our professional specialists and customer service representatives at 1-800-986-6008. You may also send us an e-mail to our customer service department at info@chiscientific.com. Gene Subcloning: You provide us with a gene name, or gene sequence, or an open reading frame (ORF) name, we will clone the gene from any tissue or any organism into our vector or your selected vector. DNA Mutagenesis: The site-directed mutation can be base substitution, deletion, or insertion. 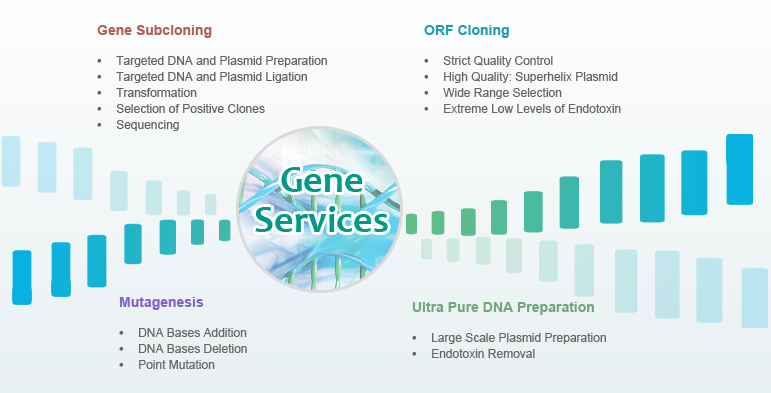 The gene can be carried on any vector and in the form of either single-stranded or double-stranded DNA (2-3 weeks).ORF Cloning: Our service for Open Reading Frame (ORF) cloning offers a quick solution to turn DNA sequences into expression-ready clones to greatly advance your biological research. With our proprietary Opti-Codon™ technology platform, we guarantee the most success for your protein expression project.